As well as supplying customers in the broadcast industry with fibre assemblies, we can support them, post-purchase, with a repair service from a contact polish to a full re-termination. Everyone in our repair shop is fully trained in all the connector types we terminate, and as we have extensive hire stock of all the assemblies we sell we appreciate that a fast turn-around means your assembly can be back out in the field quickly, were it belongs. If you've been unfortunate enough to have a cable that needs repairing or would like a general service of your cable please please contact us, or send to the address above. Should you have a cable that needs repairing or has a suspected fault please return it to the address above, with a cover note with suspected problems and contact details of you and your company. 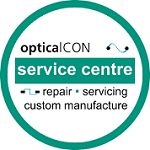 Our repair department will then test the cable and report back to you before going ahead with any repairs. Should there be any replacements, such as gaitors, heat shrink, dust-covers etc required, we will put this on the test report under 'recommendations'. Then, subject to a purchase order/pre-payment, you will get an expected lead-time for the repairs and work will begin. Please note although the upmost care is taken when dismantling, during repairs which require access to the fibre, sometimes the cores can break and will require a full re-term of the connector. This will be charged at the respective 'repair kit' rate. The customer will be informed of this before re-terminating.